Meal planning is a thorn in my side. I love how easy and streamlined it makes my life, but I hate the pressure that comes with the planning. Recently, my husband and I added a new calendar to our shared Google calendar. We named it Meal Planning and the only thing that appears on that calendar is what we’re planning to have for dinner. So each 5pm time slot has the name of a dinner and if you click on the event, the Description section of the event may contain a link to a recipe, the recipe itself (if it’s basic enough) or a basic outline of what needs to be purchased or done to get that dinner on the table. By making dinner an event, we can also schedule it for different times depending the kids’ activities on any given day. I’ve found that this helps us both know what time we need to be sitting down to eat so that the rest of the evening can run smoothly and it doesn’t leave anyone wondering what time dinner will be. My kids are still too young to be using technology this way, but I’m hoping in a few years, they’ll find this a useful organization tool as well. I’ve tried meal planning apps that are designed for this, but I love my Google calendar so much, I just couldn’t wrap my mind around learning a whole new system and then trying to get my husband on board with something new. We both use the Google calendar for pretty much all of our scheduling, so why not stick with what we know? Beyond meal planning, there’s the meal preparation. This needs to be pretty straightforward. Like all busy parents, I want healthy, easy, tasty meals that my kids will actually eat. So I spend a decent amount of time hunting down recipes that fit the healthy, easy, tasty criteria. What I need to learn from this experience is that it’s okay to eat the same dinner twice (or maybe even thrice) in one month. I really need to get over my fear of duplicating meals. If we love it and it’s healthy, why not serve it with some regularity? Variety may be the spice of life, but routine and familiarity are the backbone of parenting sanity. So, for the prep, I have my Crock-Pot to thank. Incredibly aromatic, lots of flavour, very creamy, tons of chicken and veggies. It fit the bill on all of my criteria. You can find the recipe at LittleSpiceJar.com. Tell ’em Life Takes Over sent you. 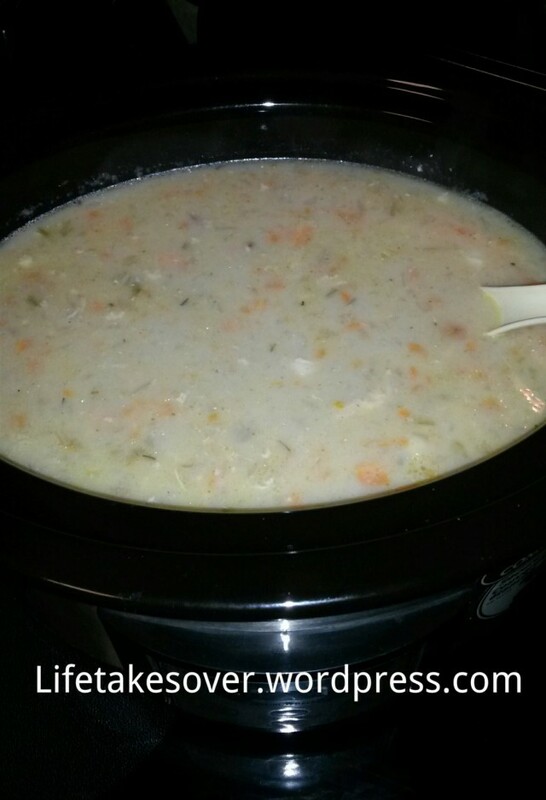 This entry was posted in Uncategorized and tagged chicken, Crock-Pot, dinner, family dinner, Food, meal planning, soup on November 3, 2015 by Nancy.